I’m beginning to think that a lot of the food I make comes purely from inspiration. It’s either that or I’m really a sucker for marketing. I was walking past a giant display of flat screen televisions and Ratatouille was playing. In terms of Pixar flicks, Ratatouille ranks up there with Incredibles and Toy Story. Sorry but Wall-e disappointed me; however, I did manage to get a well-rested sleep in a theater. Going back to Ratatouille. I thought to myself, “If a rat can do it, so can I!” I researched recipes all over the place and no one really seemed to have a standard. Thomas Keller’s French Laundry and his technique of making ratatouille inspired the movie. So I tried it out, just like Remy did…or at least a variation of it. I took all the ingredients that I found on all the ratatouille recipes on the internet, and removed some like squash florets to make my recipe. 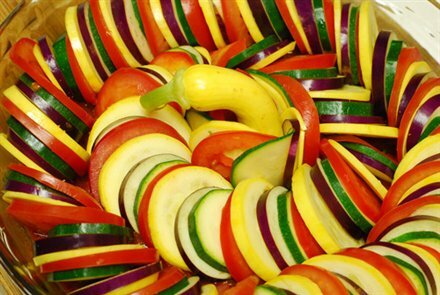 Slice the squash, zucchini, tomatoes, and eggplant into thin slices. Use a mandolin if you have one. Arrange them in a pie dish. Bake for 30 minutes in a 400-degree oven. In a separate pan, add the tomato sauce, basil, oregano, and cumin. Cook over medium heat and reduce the liquid by 50%. Disclaimer: I didn’t put exact amounts for the ingredients because I winged it. This was a lesson where I should of documented my steps. Contact me if you want more exacts. I’ll try to duplicate the recipe again. I thought about this a little more. You might want to sweat a half cup of finely diced onions in the separate pan before adding the tomato sauce, basil, oregano, and cumin. Remember that is supposed to be a simple country dish. Also, you can add a bay (laurel) leaf to the sauce. how long do you cook in the oven? Covered or no? I put it in there for about 30 minutes uncovered. Or until the veggies are fork tender. OMgoodness it looks and smells delish! I did add mozzarella and bread crumbs on top and then broil – cause I think my daughter may be disappointed…. It’s a cooking term. Leave it on the stovetop until half of the liquids evaporate. Thanks so much! I am cooking it now. The kids are super excited! I am also adding cheese to the top. I will let you know how it turns out! is tomato sauce and pizza sauce the same thing?? They are different. Tomato sauce is just tomato. Pizza sauce usually has other herbs and spices added and the tomato is already reduced. With that being said, yes, I’ve used pizza sauce as a substitute because it was what I had in stock. Taste the pizza sauce if you like it, use it. My recipe adds basil, oregano, and cumin…a good start for a great pizza sauce. The only worry I have with using pizza sauce is the amount of sugar added. Didnt the rat cover it with something before putting it in the oven? Yes, I forgot about that part. It was probably parchment paper or wax paper cut to size. Putting this paper on top will protect it from burning and provides a way of “steaming” the vegetables. Thanks for noticing that Jon! I have not made ratatouille yet. I am actually playing with my own recipe. I cook pretty much like you do-throwing things together. stuffings out of me. I had gone along throwing all kinds of things together-things that I would have never thought would go together. When it was finished–I was in shock!! It tasted wonderful!! I was amazed that I had made it. I am going to enter it into the Pillsbury Bake Off in 2011. I have come up with a whole list of additional ways to incorporate the basic sauce which is what I thought was so incredible. Ratatouille was one of the selections. I found your picture of your recipe–it is just like the movie. I love the movie. I hope you do not mind but I shared it on my facebook page. We are so much alike.I enjoyed your food trek. My daughters constantly watch this movie and every time they do, I am asked to make this dish. My cookbooks only have the soup version, but I will try this! Thanks for experimenting! This was really helpful, thanks a lot for all the explanations Edel! can you do the ratatouille with out squash ?????????? Totally. I think the whole idea behind ratatouille was to use the ingredients available to you. Made it, loved it but changed it a bit to make it my own. Before assembling things, I cut up the eggplant and removed any bitterness by letting it rest after being salted for a half hour then rinsed off the salt. Also added some roasted garlic. Great as it was, but thought I’d share the changes that I implemented to make it my own. Sounds like a great recipe can’t wait to try it:) In the movie the rat covered the bottom of the pan with the tomato sauce, but I’m afraid it would dry up in the cooking process. I know you put your sauce on at the end but then you can’t see how pretty it looks. Any suggestions for me? Definitely put the sauce on the bottom. For a more decorative top part, drizzle the sauce on top making sure not to completely cover it. To keep it moist, cover it with parchment paper. Found your site after searching the web for Swedish recipes when it hit me, it´s the WORLD wide web, isn´t it? One question though; 400-degree, thats Fahrenheit, right? You know how much it will be in Celsius? Looks beautiful! I’m looking forward to trying this recipe. Btw, 400 degrees F = 204 degrees C.